Yemen’s problems are many, but the most urgent is to make and enforce peace. That is easier than many think—if the political will is there. Unlike Syria, the Yemeni conflict is principally intra-elite and resource-driven not revolutionary. U.S. intervention into the conflict, as Jon Finer argues in Foreign Policy, is indeed a terrible idea. But what are the alternatives? Currently, transitional President Abdrabbuh Mansour Hadi is insisting on full implementation of UN Security Council Resolution 2216, while the Houthis and ex-President Ali Abdallah Salih demand a government of national unity before they consider ceding any of the power they have seized. Neither of the two opposing factions believes that it needs to compromise (and Hadi has just hardened his position). The UN special representative is thus left shuttling between two sides who each reject what the other accepts. Despite the impasse, the broad outlines of an agreement are widely understood. A government of national unity would include sizeable Houthi, Salihi, and Hiraki elements as well as representatives from Hadi-aligned groups and others such as the Tihamis. The Houthis and Salihis would withdraw and decommission their heavy weapons. All sides would complete the transitional process initiated in 2011. The key issue is sequencing. Hadi demands complete compliance with UNSCR 2216, which would allow him to return victorious to Sana’a and force the Houthis and Salihis to surrender everything they have fought for. Only then would a new, more inclusive government be formed. For obvious reasons, the Houthis and Salihis disagree, and want the government first before they give up their weapons. The surrender/withdrawal issue is a red herring. Militarily, the key issue is getting up one of the eight or so routes onto the plateau. 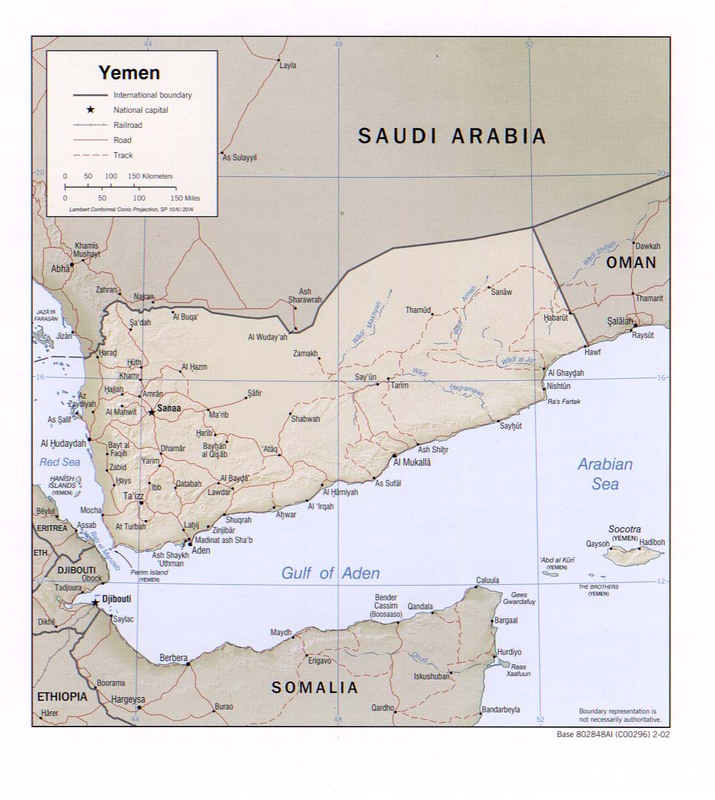 Once there, the Houthis and Salihis will lose much of their operational advantage. However, since the conflict is deadlocked, external intervention will be needed, with the US as the most able sponsor and guarantor, drawing on lessons from previous theatres, most notably former Yugoslavia as well as the 1960s Yemeni Civil War. To enable this, the malign influence of key members of the elite that has been trying to obstruct the transitional process must be constrained. As happened after the Yemeni Civil War, this will likely require their exile, probably for 15 years. Candidates across the political spectrum include: Ali Abdallah Salih and sons, Abd Rabuh Mansur Hadi and sons, Abd al-Malik al-Huthi and sons, Gen Ali Muhsin and sons, and the al-Ahmar brothers and their sons. There may be others. While all this is going on, the Saudi-led coalition should put together the funding to rehabilitate Yemeni physical and social infrastructure (the last figure published was $15 billion), to be delivered under UN supervision. There will also need to be a buy-back programme to recover the advanced materiel pushed into Yemen and its notorious arms markets, and a programme of security sector reform. There are two main problems to implementing this. Hadi and his foreign backers have major political capital invested in his return to Sana’a. It’s an existential issue for Hadi and his zumra clique, and one of face for his backers. Also, a third conflict—or conflicts—may break out. Although the Houthis and Salihis are currently fighting on the same side, they have fought each other in the past and are likely to do so again. Similarly, those forces fighting against the Houthis and Salihis, though often described as pro-Hadi, are in reality a mix of southern secessionists, local militias, moderate Islamist militia, “good” Salafi fighters, and sometimes even Salafi terrorists. It is quite possible that a peace between the sides would result in conflict among them. It is more likely that this can be avoided by a genuinely inclusive government of national unity. The alternatives are starving several million women and children to death or trying to force a way into the mountains (which will be immensely bloody). The better option is to make peace, and to concentrate all military resources, Saudi and U.S., on defeating the Islamic State. James Spencer is a retired British infantry commander who specialized in low-intensity conflict. He is an independent strategic analyst on political, security and trade issues of the Middle East and North Africa and a specialist on Yemen. Photo: Abdrabbuh Mansour Hadi.